I just wanted to say WOW!!!! I just wanted to say WOW!!!! I have today received my 2nd Dogmatic Headcollar (first one was the wrong size), and all I can say is awesome!! I have 2 dogs, my older dog, already has a head collar, and I am fine with the fit and the design for her, but not for my new rescue dog, the other head collars just wouldn't fit. 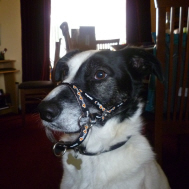 He is a Collie cross, but his muzzle is long and very thin. He is a nightmare to walk around other dogs, and the other head collars, just kept getting in his eyes, whilst attempting to control him. I have taken them out today (couldn't wait to try it out!) Charlie with his new Dogmatic collar, and oh what a lovely walk we had, ok he still attempted to get to the dog on the other side of the road, but I was confident this time, I wouldn't be hurting him, whilst trying to have a nice walk. I looked at him and the Dogmatic stayed in place, no where near his eyes. Thank you for all your help with sizing, I would highly recommend this product, it does it's job perfectly. No more sore arms and shoulders for me, just nice walks.